Be sure to sign up for my email list to get new recipes and ideas in your inbox! If you love chocolate dipped strawberries, give these 5 Ingredient Strawberry Fudge Truffles a try! They are a perfect way to enjoy the sweet taste of that classic flavor combo in a tiny little bite! And are so easy too. 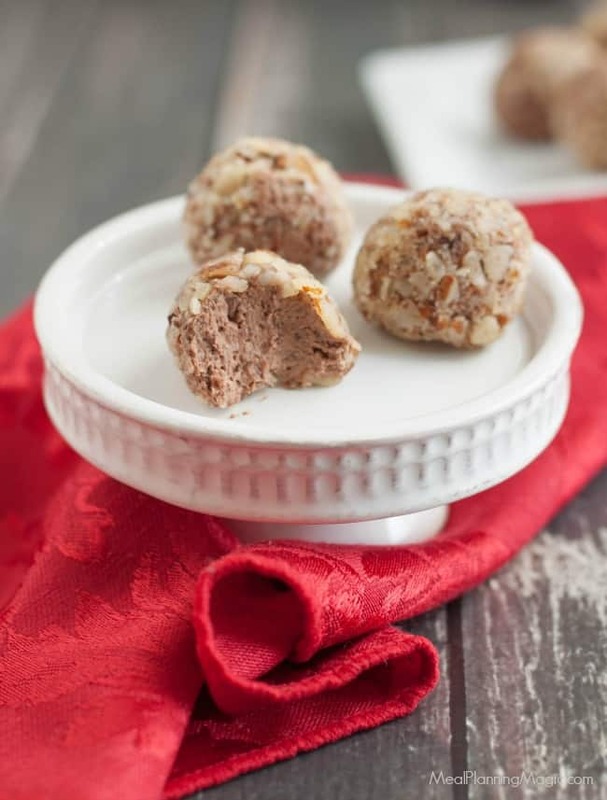 Click here to PIN this Strawberry Fudge Truffles recipe to remember to make it later! Y’all, I love fruit and chocolate combinations like these Chocolate Cherry Cut-Out Sugar Cookies or even this Peanut Butter Chocolate Banana Latte. Everything’s better with chocolate right? So when I came across this recipe in a magazine I knew I just had to try it! 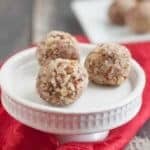 If you love strawberries dipped in chocolate, these Strawberry Fudge Truffles are a unique twist on that flavor combination. With only a few ingredients they are super simple to whip up. I actually made these a few days ahead of time and kept them in the freezer until I was ready to serve them. They were still perfectly delicious! I changed up the original recipe a bit to include fresh strawberry puree instead of strawberry preserves. I added a bit of powdered sugar to my recipe but if you have really sweet strawberries, you can probably skip that altogether. These would be perfect for a special holiday like Valentine’s Day or just because! These Strawberry Fudge Truffles really are so easy—I hope you give them a try! If you love chocolate dipped strawberries, give these 5 Ingredient Strawberry Fudge Truffles a try! They are a perfect way to enjoy the sweet taste of that classic flavor combo in a tiny little bite! And are so easy too. In small, flat bowl, add chopped almonds. Set aside. In bowl of a food processor, pulse vanilla wafer cookies until they are fine crumbs. If you do not have a food processor, you may also put cookies into a ziptop bag, seal and then crush them with a rolling pin. Set aside. In medium bowl, beat cream cheese at medium speed with an electric mixer until creamy. Add melted chocolate, beating until smooth. Stir in vanilla wafer crumbs and strawberry puree. 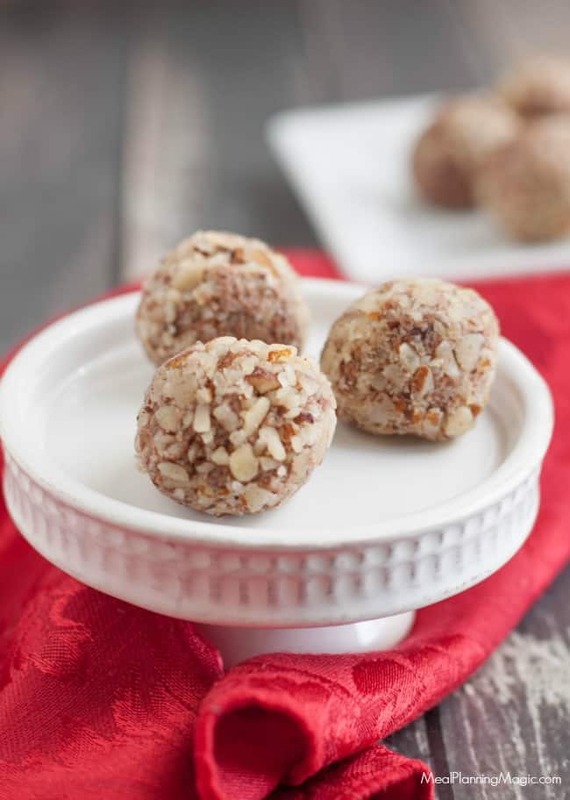 Shape into one-inch balls; roll in chopped almonds. Cover and chill one hour until ready to serve. Fresh or frozen strawberries may be used. I used frozen strawberries and pureed them in a blender straight from frozen. Today I’m sharing this recipe along with dozens of other food bloggers to bring awareness to the good work being done by Cookies for Kids Cancer. Even though my recipe is not a cookie recipe, it can still be made and sold at a bake sale if you choose to coordinate one. (We did one year and it was a great success! You can read more about that here). Or make them for your loved ones and then make a donation instead to support Cookies for Kids Cancer. We are doing this event because we want to make a difference in the fight against pediatric cancer. Help us make a difference by donating to Cookies for Kids’ Cancer! Our goal is to raise at least $3000. Because these three companies: Dixie Crystals, Land O’Lakes and Mediavine have each pledged to match our donations raised through this campaign up to $3000!!! Currently, we have raised: $1,465 ALMOST half way towards our $3000 goal, will you help us with a donation today? Every little bit helps! Have a question or want to share recipe ideas with others? Then join my private Facebook group, Meal Planning Magic Community Table here. If you’ve already joined, be sure to add your friends that may find it helpful too! 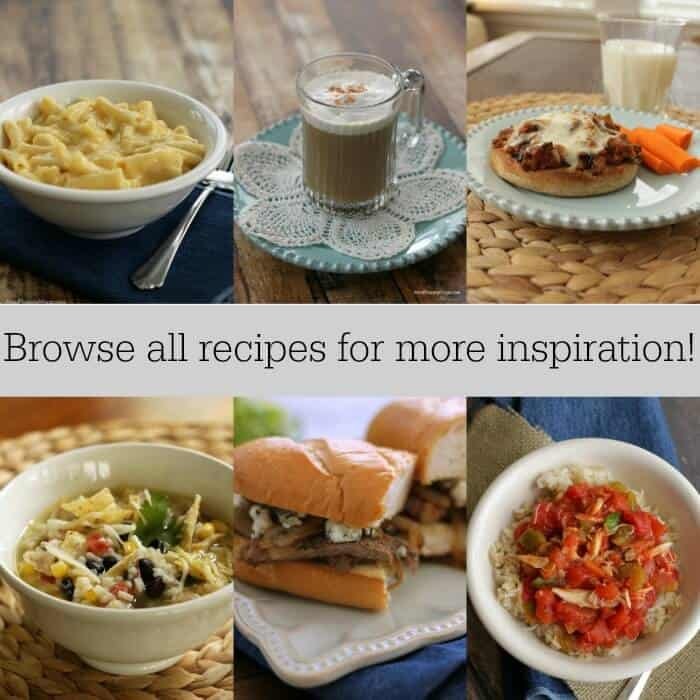 Click on the photo below to browse more of my recipes! Very cool recipe and great photos. I’ve never actually had strawberry truffles…see raspberry mixed with chocolate ganache all the time, but this is a really cool spin on the popular raspberry version. The cream cheese is a nice touch since they will be more stable then using cream. Have to try this out. I’m the one with the sweet tooth here at home so it’s up to me to make desserts. These truffles are superb.